How to prepare and adapt your company for the new digital landscape. One of the book's many illustrations by Veerle Pieters. As web professionals we often find that the organisations we work for are more of a hinderance to digital success than a help. Company culture, operating procedures and business strategy are rooted in the past and have failed to adapt to the emerging digital economy. What worked in the past no longer does and your organisation needs to evolve. If your organisation is going to harness the full potential of the web, we believe it needs to make fundamental business changes. Download the complete manifesto to see what your organisation needs to do. Nothing is more frustrating than stubborn management entangled in dated workflows and inefficient processes. That's why we created Digital Adaptation, a new practical book on how to help senior management understand the Web and adapt the business, culture, team structure and workflows accordingly. No fluff, no theory — just techniques and strategies that worked in practice and showed results. The book will help traditional businesses and organizations to overcome their legacy, and help you plant the seeds of change with very little power. If you do want to finally see changes happening, this is the book to grab. Written by Paul Boag. Designed and illustrated by Veerle Pieters. 176 pages. The print release is scheduled for March 27th 2014, but the eBook is already available. Get the book now. Break down the walls and nourish collaboration, ownership and innovation. Summary • The foreword introduces the purpose of the book and explains why we decided to choose you as the audience for it. In fact, the book is written primarily for you as web professionals. A book you can quote to senior management and make real, lasting changes in your organization. Your job is to take the concepts covered in this book and put them in front of senior management. Keywords • audience • strategy • video. Summary • The core problem with digital, faced by many large organizations, is that they were formed before the web as we know it today existed. Their systems, processes, and (in many cases) people are not configured to support it. In this chapter, Paul discusses warning signs of digital incompatibility in your company, organizational and cultural barriers and changes that the new digital landscape has brought. This is a chapter of how most organizations struggle with their digital strategy and what you have to know to avoid the problems in a long run. Keywords • pre-web organizations • legacy systems • digital incompatibility • structure • fragmented web presence • culture • customer needs • shifting digital landscape • digital strategy. Summary • As Richard Rumelt said, “good strategy works by focusing energy and resources on one or a very few pivotal objectives whose accomplishment will lead to a cascade of favorable outcomes.” In this chapter, you’ll learn how to select the right digital direction and how to deal with prioritization paralysis. Backed up by case studies and real-world examples, you’ll also learn how to form a digital strategy and how to use guiding principles, digital policies, and a responsibility matrix to complement the strategy. The chapter also explains how reorganizing teams and processes will help tackle dated, inefficient departmental structures. Keywords • business objectives • digital team • defining priorities • problem diagnosis • guiding principles • web steering committees • responsibility assignment matrix • digital policy • remote work. Summary • Forming a digital strategy is one thing, but making it work requires changes in the digital culture. This chapter discusses main components of a digital culture, including collaboration, agile development, digital by default, innovation and service-oriented culture. The web can’t be neatly separated from the rest of organization; what’s necessary is a single organizational strategy that is heavily influenced by online. This chapter explains just how such a strategy can be established in practice. Keywords • Gov.uk redesign • digital by default • aspects of digital • Business Model Canvas • innovation and failure • service culture • user testing • customer engagement. Summary • There are various ways in which digital teams can be organised, but some approaches are more effective than others. This chapter discusses how to build an effective team and what role it should have, as well as how to find a good digital lead and attract and retain appropriate digital staff. Sometimes the digital team can feel like a Ping-Pong ball that ricochets around the organization—you are never quite sure where it will end up. 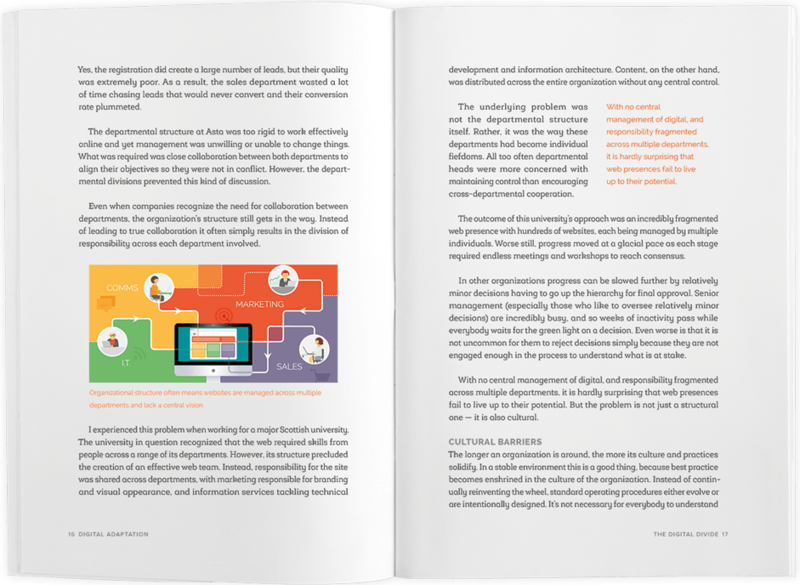 This chapter explains the place, the position and the working environment of an effective digital team. Keywords • team structure • roles and responsibilities • digital leads • attracting good staff • light leadership • working environment • skills, not roles • hiring digital workers. Summary • There is no shortage of big digital failures, from the London Olympics website to the Healthcare.gov website. The costs are staggering and the impacts devastating. The more complex and ambitious a digital project, the more traditional management approaches will struggle to scale. This chapter explores why digital projects fail and how you can minimize the risk of this happening by identifying and prioritizing user needs and involving the entire digital team in the conversation. Of course, this would work best within an iterative and collaborative context in which failure, prototyping and experimentation are deeply rooted within the digital culture. Keywords • failures • the boom-bust cycle • usability testing • user needs • prototyping • iterative, incremental process. Summary • Anybody can instigate change. As somebody working at the grassroots level of your organization’s digital strategy, you are a key catalyst of change. That work begins in your own team. You can plant the seeds of change by establishing good team-working relationships and atmosphere, enforcing good working practices, building bridges with colleagues and educating them, approaching management strategically, and being disruptive. If you don’t take action to change it, nobody else will. But if you do take action, there is a real opportunity to make your work more enjoyable and to have a real impact on your company. Keywords • down-top change • transforming a team • wartime mentality • work environment • work practices • convincing management • SWOT analysis • disruption. Paul Boag is quite a character. With over 35 articles published on Smashing Magazine, he is not really an author that requires an introduction. Paul has been working on the web since 1993. He is web strategist at Headscape Ltd, a web design agency that he co-founded back in 2002. Paul also produces and hosts the longest-running web design podcast at boagworld.com. He is a regular speaker at conferences and author of Client-Centric Web Design. The eBook is included with the printed book for free (PDF, ePUB, Kindle). Worldwide airmail delivery from Germany ($5 intl. shipping).